– Muhammad would enter into Makkah’s Grand Mosque. – Muhammad would enter in a state of security. – Muhammad and his companions would get to perform pilgrimage and fulfill its rituals. Ignoring the hostility of Makkans, Prophet Muhammad gathered his companions and embarked on a peaceful journey to Makkah. But the Makkans continued to be hostile and he was forced to return to Madinah. The vision remained unfulfilled; however, an important treaty was signed between the Prophet and the Makkans, which would prove of great significance. It is due to this treaty that Muhammad performed a peaceful pilgrimage with his companions the very next year. The vision had found its fulfillment. Umar, the second caliph of the Muslims after the Prophet, used to say that they did not know how the Quranic prophecy would be fulfilled until they themselves witnessed it coming true at the famous battle of Badr! How such a promise from Almighty God would be fulfilled to the oppressed, brutalized Muslims in Makkah was impossible to imagine at the time it was made. It was fulfilled, nevertheless. Indeed, God made Muslims secure and gave them political sway in a matter of years. At first, the Muslims established their own state, by the invitation of the people of Madinah, when God commanded they migrate there from Makkah. Then, within the lifetime of the Prophet, that state expanded to hold sway over the whole of the Arabian Peninsula, from the Gulf of Aqabah and the Arabian Gulf to the Arabian Sea in the south, including the place from whence the Muslims had been driven out of (Makkah itself). (For) indeed if they are driven out they go not out with them, and indeed if they are attacked they help them not, and indeed if they had helped them they would have turned and fled, and then they would not have been victorious. 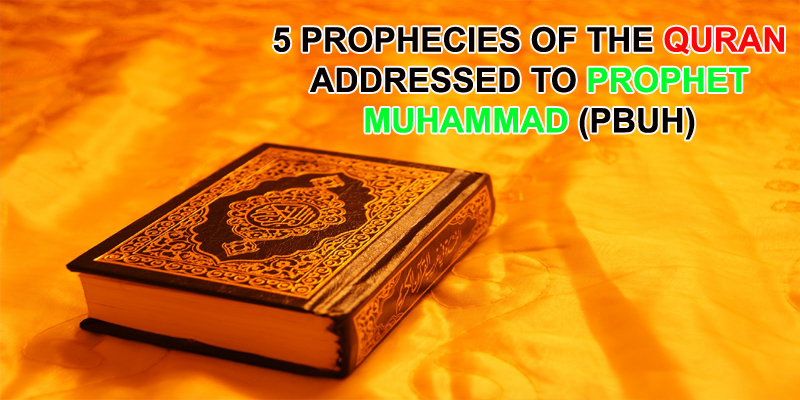 We see from the prophecies discussed in these articles that the claim many detractors of Muhammad’s Prophethood are utterly unfounded. They have based their criticism on the challenge to show that what Muhammad (peace be upon him) foretold, if anything, and what came true of his foretelling. Demonstrably, he did prophesize, with God’s guidance, and demonstrably, what he was directed to tell us did actually occur. Therefore, by the criterion of the detractors, Muhammad was the Messenger of God, and the last of the prophets to be sent, by both his statements in the Sunnah (narrations from his life) and the word of the Quran.